Provide comfort for the family of Hazel Pickel with a meaningful gesture of sympathy. 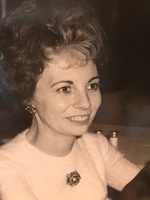 Hazel Edyth Pickel, 89, of Chicago, Illinois passed away peacefully on March 20th, 2019. Visitation will be held from 9:00 - 11:00 am on March 23 at St. Peter Lutheran Church 3200 Asbury Rd. Dubuque, IA with the funeral service immediately following at 11:00 a.m. Burial will be in St. John’s Lutheran Cemetery to follow. Ms. Hazel Pickel was born in Grant County Wisconsin on September 4th, 1929 the daughter of Rudolph Carl and Gertrude Madelaine (Kopp) Pickel. She worked as a Sales Administration Specialist for General Electric Major Appliances. She had a love and passion for gardening flowers, quilting, and cross stitching where she won many awards. She also enjoyed spending time with her family. She leaves behind a surviving brother Kenneth L. Pickel (Bette Pickel), niece Rhonda (Pickel) Schultz and Roger Schultz with great-nieces Ashley, Alicia, and Brittany with many other nieces and nephews. She was preceded in death by her parents Rudolph Carl Pickel and Gertrude Madelaine Kopp; six brothers Carl Pickel, Melvin Pickel, Elmer Pickel, LaVern Pickel, Lester Pickel, and Junior Pickel; and one sister Ruth Bruun. In lieu of flowers, memorial contributions can be made to the Dubuque Arboretum. To send flowers in memory of Hazel E Pickel (Pickel), please visit our Heartfelt Sympathies Store.